Johannes Kepler (27 December, 1571 – 15 November, 1630), a kenspeckle chiel in the scientific revolution, wis a German astronomer, mathematician an astrologer. He is best kent for his laws o planetary motion, pit furth in the twa beuks Astronomia nova an Harmonices Mundi. Kepler wis a professor o mathematics at the Varsity o Graz, court mathemateician ti Emperor Rudolf II, an coort astrologer ti General Wallenstein. 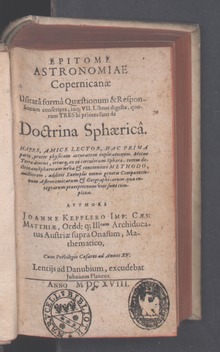 Aerlie in his career, Kepler wis an asseistant ti Tycho Brahe. Kepler's career wis at the same time as Galileo Galilei's ane. He is whiles cried "the faremaist theoretical astropheesicist", atho Carl Sagan cried him the hindmaist scienteific astrologer forbye. Wikimedia Commons haes media relatit tae Johannes Kepler. This page wis last eeditit on 28 September 2018, at 16:19.